Perched on a ridge at Knøsen, near Skamstrup, the air observatory tower is one of the last remaining testimonies in West Zealand to the Cold War. There were originally some 400 of these towers dotted around Denmark. More than half were surveillance posts on tall city buildings, while around 160 were 6-9 metre high iron lattice watchtowers sited at high points in the countryside. All of the iron watchtowers have been demolished with the exception of this single surviving air observation tower in West Zealand. Under Luftmeldetjenesten, the Danish air observation service established in 1934, civilian volunteers were organised to report on activity in Danish airspace. 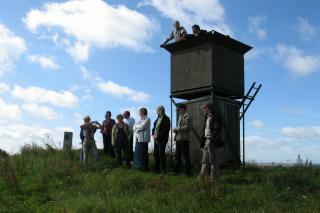 In 1952, the service was brought under the Air Force Home Guard as Luftmeldekorpset, the Air Observatory Corps. The corps staff scanned the skies for enemy aircraft from the air observatory towers, all of which were sited to provide a good view of the landscape. Reports of activity were to be submitted to one of Denmark’s seven “LAVAC” (low level control centres). At the Knøsen air observatory tower, reporting was to the LAVAC at Nykøbing Falster, which was built in 1955. Reporting was by a simple telephone call. Inside the LAVAC bunker, a decision was then made on the response to the incoming observations. The network of air observatory towers, each of which reported to a LAVAC, provided a continuous overview of the situation if aircraft were to enter Danish airspace by flying low so as evade radar detection. The Air Observatory Corps was stood down in 2004.